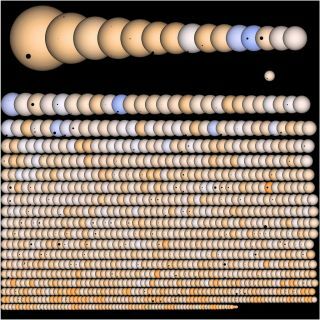 A photo may be worth 1,000 words, but a new depiction of NASA's Kepler mission is worth 1,235 potential alien planets. Created by a devoted mission scientist, the image takes stock of the Kepler observatory's prolific planet-hunting results so far. The graphic is the brainchild of scientist Jason Rowe, who created it in an attempt convey Kepler's exoplanet discoveries to the masses in a clear, concise manner. In Rowe's graphic, the parent stars of Kepler's potential alien worlds are arranged by size, with the largest at the top left of the diagram and the smallest at the bottom right. For reference, our own sun is shown sitting by itself, just beneath the top row. Both Jupiter and Earth are depicted transiting the sun in the illustration, researchers said. NASA launched the $600 million Kepler observatory in March 2009 to seek out planets circling alien stars. To do that, the spacecraft is staring continuously at a single patch of the sky, watching for tiny changes in the amount of light coming from every star it sees. Astronomers use other telescopes to follow up Kepler's findings in order to confirm whether or not the candidate stars do, in fact, host exoplanets. To date, Kepler has discovered 1,235 possible planets, with 54 of those candidates located within the so-called "Goldilocks zone" — that just-right range of distances around a star in which liquid water could exist on a planet's surface. Based on the amazing wealth of planet candidates from Kepler, astronomers have estimated that our Milky Way galaxy could hold as many as 50 billion alien planets, with 2 billion of those perhaps being about the size of Earth.